But he stressed there was no evidence of successful interference in UK polls. Mr Hunt called for economic and diplomatic sanctions to be part of the response to attacks. He added that the government was expanding its network of "cyber attaches" - diplomats working with governments around the world to address the problem. Russia, China, Iran and North Korea have all been accused of being behind various hacks and online campaigns in recent years. Last year, the UK blamed Russia's GRU intelligence agency for a number of high-profile cyber attacks, including the hacking of Democratic National Committee emails in the run-up to the 2016 US elections. Speaking at Glasgow University, Mr Hunt said it was a "material fact" that Russia had tried to "subvert democracy", the implications of which were "profoundly disturbing". "At a minimum, trust in the democratic process is seriously undermined," he said. "But in a worst-case scenario, elections could become tainted exercises, robbing the governments they produce of legitimacy. "And the greatest risk of all is that a hostile state might succeed in casting a permanent cloud of doubt over an entire democratic system." Mr Hunt said in the cyber era, hostile states no longer need to fight wars to subvert democracy. Using cyber experts, they could, at minimal cost, use propaganda to influence swing voters during election campaigns, he said. "In a country with an electronic voting system, they could potentially manipulate the result itself." 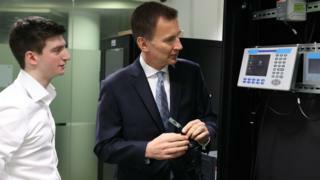 Mr Hunt called for an improved strategy in the fight against cyber attacks directed at democracies, arguing there should be a "doctrine of deterrence". This should involve making states pay a "price" for carrying out malicious cyber activity. Nations responsible should be "named and shamed" and their methods exposed so that the cyber-security industry can develop protective measures. Mr Hunt also said perpetrators must be made to believe that they run a "credible risk" of facing economic and diplomatic penalties. Those responsible for cyber crime should also be prosecuted, he said, and international allies should consider what further steps could be taken, in international law, to deter further attacks. "We can no longer afford to wait until an authoritarian regime demonstrably succeeds in changing the outcome of an election and weakening trust in the integrity of democracy itself," Mr Hunt added. "The risk is that after just a few cases, a pall of suspicion would descend over a democratic process - and once that happens, the damage would be difficult, perhaps impossible, to repair."